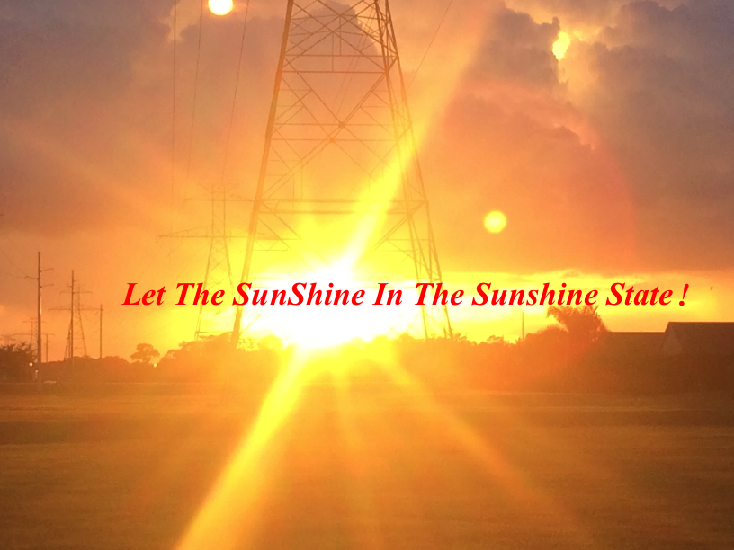 Let The SunShine In The Sunshine State ! As a resident of Florida, I am naturally very concerned about future welfare of the state of Florida. To prevent losing portion of the state of Florida to the ocean within our life time, further development of extreme climate conditions while helping renewable energy industries to thrive in Florida, the most effective policy is to implement Feed-In-Tariff For Solar/Renewable Energy With Incorporation of Value of Solar/Renewable Energy. This policy will lead to reduction of CO2 and our utility bills, solving energy and pollution problems while creating local jobs. For better understanding of the topic of Feed-In-Tariff policy and Value of Solar, please visit and share links below. In the state of Florida, there is plentiful Sunshine that can be put into good use. Sunshine has proven to be the least harmful source of energy and will soon be the least costly source of energy as well. Incorporating Value of Solar/Renewable Energy via Feed-In-Tariff is the most fair and effective way to utilize our solar/renewable energy. and we can Let the SunShine In The Sunshine State! 7. Let’s Move Our 50 States Toward Clean Energy! The Clean, Renewable Energy Movement Is Here! 8. Help Your School Districts/Administrators To Save A Million Dollars! 9. Join Us, at Sunisthefuture Team at Kiva, to Spread More Sunshine! This entry was posted on Wednesday, September 24th, 2014 at 7:17 PM	and is filed under Editorial, Educational, Policies. You can follow any responses to this entry through the RSS 2.0 feed. You can leave a response, or trackback from your own site.